This ticket is for one attendee at the New Product Blueprinting Open Workshop and includes breakfast, lunch and snacks as well as all course materials and a group dinner on Wednesday evening. Lodging and transportation are the responsibility of the attendee. If you wish to be INVOICED, please select "Pay by invoice" on the next page under "Payment Method." To view available "early bird" discounts (available up to 30 days before event), select arrow next to ticket price above. Since 2005, thousands have learned New Product Blueprinting one way: their company hosted an in-house workshop. Now you can attend a open workshop taught by The AIM Institute’s founder, Dan Adams, and top members of the AIM team. 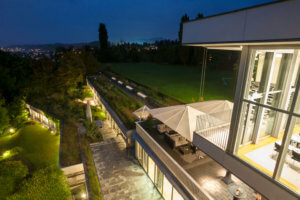 Location: The workshop will be held at the Gottlieb Duttweiler Institute (GDI) one of Switzerland’s leading think tanks. 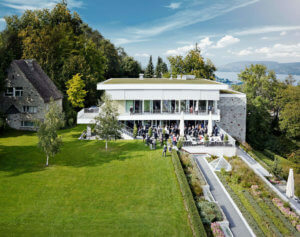 Just ten minutes from Zurich, the GDI is surrounded by parkland with a panorama across the lake to the Alps. It is a bright, modern facility with first-class cuisine. What you’ll learn: 1) At the end of these two days, you’ll be able to use your new listening, probing and interview skills—as well as Blueprinter® software and job aids—to conduct qualitative Blueprinting Discovery interviews, the most advanced and effective means available today for gaining B2B customer insights. Beyond this, you’ll develop a working knowledge of the remaining New Product Blueprinting steps, with an emphasis on quantitative Preference interviews and their analysis. What you’ll take home: At the workshop, you’ll receive all the software, e-learning and BlueTools® (special aids) that in-house workshop learners receive. At no extra cost, you’ll also receive 12-month access to the AIM’s cloud based Blueprinter 5.0, which covers market segmentation, Discovery and Preference Interviews, analytics charts, and a Market Case for entering the development stage. Learning Approach: Expect a highly-interactive and entertaining workshop. Over the last ten years, your lead instructor’s workshop evaluations have averaged 9.2 of 10. In fact, over 2/3rd of in-house workshop participants rate this in the top 10% of workshops ever attended. The workshop combines classroom lecture, in-class exercises, and breakout team role-playing. Breakout teams of 5-6 persons each will get substantial hands-on practice in listening, probing, interviewing and related skills. Attire: Business casual: Consider a light sweater or jacket for your comfort. Fee: $2995. 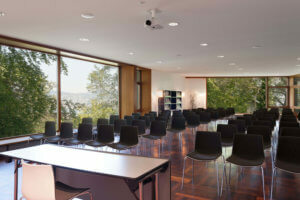 Includes all program materials, continental breakfasts, lunch and light snacks. Early Bird Discounts: A $400 "super early bird" discount is available until 60 days prior to the workshop and a $200 "regular early bird" discount is available until 30 day sprior to the workshop. Next Steps: 1) Use the Order Now button at the top to register for this workshop. 2) Book your sleeping room. Information: For more information on the course, visit our website. For logistics details, contact ann.eiden@theaiminstitute.com. For other questions, contact scott.burleson@theaiminstitute.com. Full refund will be permitted if AIM is notified in writing by attendee of cancellation at least 60 days prior to the event. A 50% refund will be given if notified at least 30 days prior to the event. No refunds will be given if cancelled within 30 days of event, but a) your fees can be applied to a future workshop (open or in-house), or b) you may substitute another attendee from your company. Payment in full is required prior to course participation. Registration is not considered complete until payment has been received. AIM reserves the right to cancel this course in the event of low enrollment. Should a course be cancelled due to low enrollment, all registration fees will be refunded. However, AIM is not responsible for any additional expenses incurred (ex. airfare and/or accommodations), and will not reimburse any additional expenses. Only one coupon code can be used per person per workshop. Coupon codes cannot be combined with any other codes or discounts. By submitting your information, you agree to receive electronic communications from AIM. You may unsubscribe at any time. Terms and conditions apply to all participants. By placing order, you agree to these terms and conditions. At The Advanced Innovation and Marketing Institute, known as The AIM Institute, our mission is to help B2B companies excel by creating products and services that their customers will love, competitors respect and stockholders applaud. Our approach is found at the intersection of leading innovation science and practical, proven methods. B2B companies can expect sustainable growth when they plug into The AIM Institute. They will find a pragmatic approach built within a system of software, consulting, training and mentoring.